Costume designer Leech (The Dollies Put On a Play, 2009, etc.) 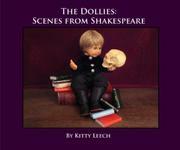 has created engaging tableaux of scenes from a variety of Shakespeare plays for the picture-book crowd. Each spread features a photograph of the actors—18-inch dolls—in richly detailed dress against luscious backgrounds on the right, with a quote from a play on the left. The first spread portraying Romeo and Juliet on the balcony will surely draw the youngest readers into the beautiful world Leech and her talented team have created. The charming photo shows a caped Romeo climbing toward Juliet, in period dress and snood, whose balcony appears to be made from an oversize flowerpot with real-looking climbing ivy; dramatic clouds light the night sky in the background. The text reads simply: “O Romeo, Romeo! Wherefore art thou Romeo?” with speaker, play, act and scene noted. Since the text is entirely penned by Shakespeare, the author’s contribution is in the selection. Tantrum-prone youngsters are likely to relate to Katharina’s speech from The Taming of the Shrew: “Nay then, do what thou canst. I will not go today; no, nor tomorrow, not ’til I please myself.” However, Falstaff’s lines from Merry Wives of Windsor may first alarm and then confuse young readers: “They are fairies; he that speaks to them shall die. I’ll wink and couch; no man their works must eye!” The spread showing young Hamlet holding poor Yorick’s skull, seemingly freshly dug from a woodland grave, may stir up some questions. Young readers will also be fascinated by the three witches from Macbeth and delight in the musicians from Twelfth Night and Titania and Bottom’s flowery bower from Midsummer Night’s Dream. In the scene showing Prospero engaged in secret studies, the detail in his scarf, robe and scepter is remarkable. While the picture-book age group is too young to appreciate the plots and meanings of Shakespeare’s plays, this confection will give them a good taste of Shakespeare’s world and the desire to explore it more fully when they are older. One of the few books about Shakespeare that children and adults can equally enjoy sharing.